Have you heard about the latest wellness movement? It’s #wycwyc (pronounced wick-wick) and stands for “What You Can, When You Can.” The brainchild of Roni Noone and Carla Birnberg, the concept is that the crazy fad diets (cabbage soup, anyone?) and the marathoner mindset don’t help anyone actually become fit and healthy for life. Instead, the small daily actions that we squeeze into our real, overstuffed lives are what actually makes a difference long term. For example, when going to Target, park as far as possible and get some extra steps in #wycwyc. Or get the side salad instead of the fries at the burger joint #wycwyc. Go to bed early so you’ll be ready for tomorrow #wycwyc. I’ve been listening to their podcast on my own daily walks (#wycwyc baby!) and I love it. It’s like chatting with my best girlfriends (none of whom, sadly, live close enough to take a daily walk together). Their book recently came out. 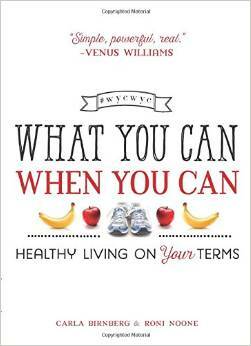 It’s a series of short essays illuminating and exemplifying the #wycwyc philosophy and integrating it into your daily life. 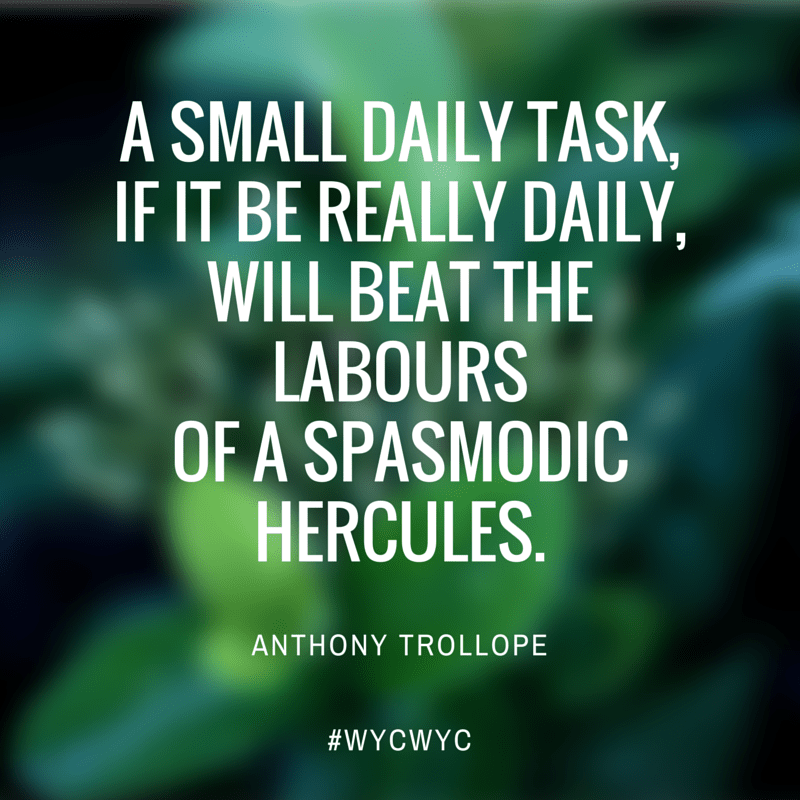 It’s just the daily shot of motivation needed to keep #wycwyc-ing your way to your goals. Carla and Roni really want to create a social media community of wycwyc-ers coalescing around the #wycwyc on Twitter, Facebook, and Instagram. They are both super friendly and approachable, real women who really understand the struggles faced by the average woman, in the real world. Roni’s Green Lite Bites has long been a favorite go-to recipe site for me. As I was reading the book though, I was struck at how I, unknowingly, used the #wycwyc philosophy to change fiction writing from a hobby I dabbled in to my new career. I used to believe that I would write when life settled down and I had time—hours on end to devote to my craft, perhaps with a manservant or two to see to my every need. Guess what? That’s not happening. I will never have hours on end, free of all other responsibilities or interests to pursue my writing. Instead, I took the Chuck Wendig of Terrible Minds, challenge to write 350 words a day, every day, no excuses. (Link does contain some NSFW language but, if you’re a writer, you can’t beat Wendig’s down to earth approach and fantastic approach. Read Terrible Minds!) So, I started writing 350 words a day, whenever I could squeeze it in. Sometimes that meant at lunch, sometimes waking up before Fox, sometimes staying up crazy late. But I did it. And some days it was just 350 words and then sometimes, I’d make 1000+ words a day. I kept up my streak for 254 straight days, until we took a family vacation at Disney World. By then, writing every day was an ingrained habit. 3) Listen to writing podcasts on your walk (double #wycwyc). Start with anything by StoryWonk. Their podcasts are master classes. What can you do to #wycwyc your way to your dreams?